Visby/Stockholm -- The first Nordic Rainbow Island festival took place as part of the discussions, song, music and film-filled 1st Gotland Pride in Visby and elsewhere on this Baltic island October 4-7, 2012. Festival seminars tackled the questions of how to boost LGBT contacts and co-operation between the Nordic islands as well as how to stop the rainbow "brain-drain" from the islands by combating homophobia and discrimination and creating such events as Prides and other LGBT happenings to enrichen rainbow life and culture on the islands often loosing residents to the bigger cities on the mainlands. 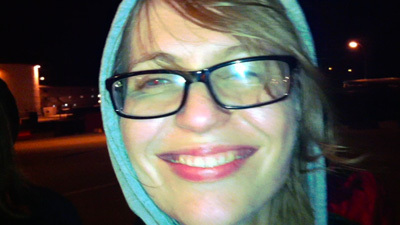 "We and others have long been thinking of the idea of creating a Nordic island network, were very pleased to attend this event and offer Mariahamn as the site of the next Nordic Rainbow Island Festival in 2013, " says Lina Atman of the Regnbågsfyr (Rainbow Light House) on Finland's Swedish-speaking Åland islands in the middle of the Baltic Sea. Festival events also included the display of works from the Tupilak/ILGCN Travelling International Rainbow Art & Photo Exhibition at the main Pride venue -- Visby's glass-walled library near the sea -- and the library of the inland town of Roma, as well as film screenings by Polish film maker, Malga Kubiak. She also filmed the festival's torch-lite, after-dusk ceremony at the stone-mound, LGBT monument on the Visby shore line -- the first such monument in the Nordic zone. "We will continue to look for Nordic Council and other international and national supporters as well as private doners so that we can bring in LGBT colleagues and cultural workers from the Faroes, Greenland, Iceland, Bornholm, Svalbard and the Estonian islands to future island festivals in this vast region stretching from off the coast of North America in the west to the Russian and Belarus borders on the east, "says Bill Schiller of the festival organizers Tupilak (Nordic rainbow cultural workers) and the ILGCN (international rainbow cultural network) . "We were also pleased this year to have foreign guests from Poland, Belarus and Russia -- adding their voices to the seminar on "Nordic Islands in the World" underlining the importance of island contacts also with LGBT colleagues beyond the Nordic region." 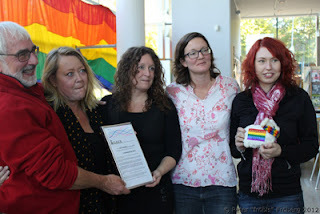 During the festival, Tupilak handed over its annual "Sowelu" award for outstanding LGBT work by women to Ulrika Westerlund, the president of the RFSL, (Sweden's national LGBT rights organization) and the ILGCN handed its "Arco Nordica" for pioneering LGBT work to RFSL-Gotland and all the other organizers of the 1st Gotland Pride -- an award which included art work donated by Swedish Tupilak member, photographer Elinore Lindén Strand. 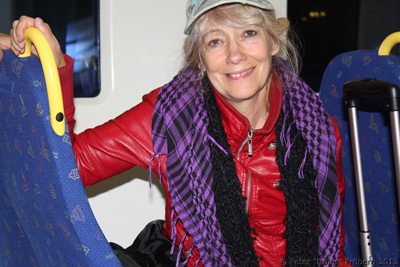 The festival received economic support from ROHS (the Swedish LGBT solidarity organization) as well as assistance with reduced priced tickets from the Destination Gotland ferry service between the island and the mainland. As a pre-festival ceremony at the prize-winning Stockholm gay bar Side Track, delegates on their way to Visy described the ambitions to create an LGBT island network. In addition, Tupilak's "Polar Bear" award diploma for the promotion of LGBT film work was handed over to Swedish Radio film journalist Roger Wilson and the ILGCN's "Sapho in Paradise" award for outstanding contrbutions to LGBT publishing, libraries and archives was handed over to the non-commercial collective producing the Swedish arts and debate magazine, "Mums." Note: More information, full award motivations and photos are available from the ILGCN Information Secretariat.